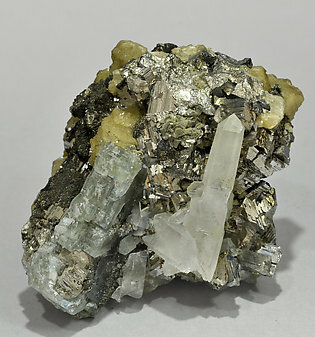 Parallel polycrystalline Arsenopyrite growths with dark gray Stannite intergrowths and leafy Muscovite aggregates, partially coated by small white Calcite crystals and aggregates of cubic Pyrite crystals. We’ll send a copy of the analysis of the Arsenopyrite to the buyer. 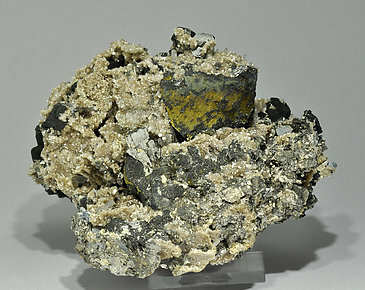 Complex crystals of Chalcopyrite, very bright and with clearly curved faces and edges, covered by Stannite forming a crust, with minor Galena and prismatic crystals of Arsenopyrite. Interesting and original. 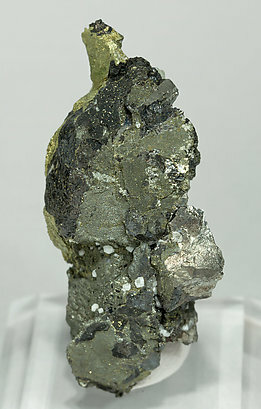 Brass-colored Chalcopyrite crystals with superficial iridescence, with slightly golden dark gray Stannite intergrowths. 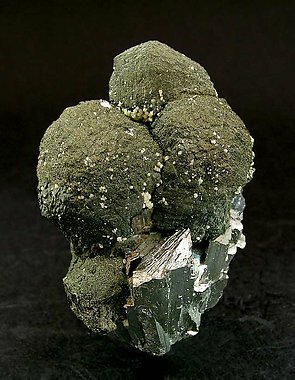 They are on matrix, with Arsenopyrite crystals and Muscovite coatings. We’ll send a copy of the analysis of the Stannite to the buyer. Curious tabular Fluorapatite crystal with very well marked parallel growths. 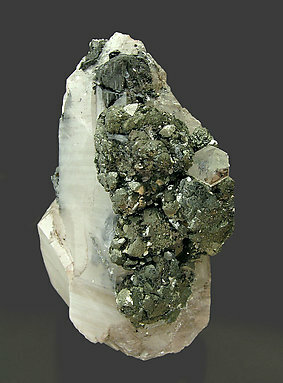 It is translucent, with Arsenopyrite inclusions and on matrix, with Arsenopyrite, Quartz, Siderite and Stannite crystals. We’ll send a copy of the analysis of the Fluorapatite to the buyer. 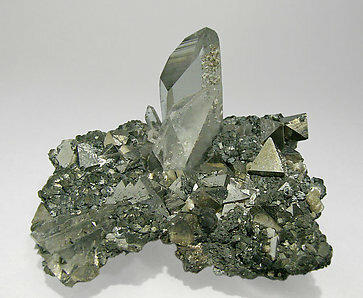 Transparent Quartz crystal, coated by very pale lenticular Siderite crystals and dark Sphalerite aggregates coated by Stannite and with small Chalcopyrite and Pyrite crystals. The sample is from the Alain Martaud collection, whose label we’ll send to the buyer. The sample is magnificent both for its size and the quality and definition of the groups of Stannite crystals on Quartz with Ferberite. The specimen had been analyzed to confirm it is really Stannite and not Sphalerite, because on Chinese samples such confusion is possible. The specimen has been published in the book ‘China’, by Berthold Ottens, on page 526. 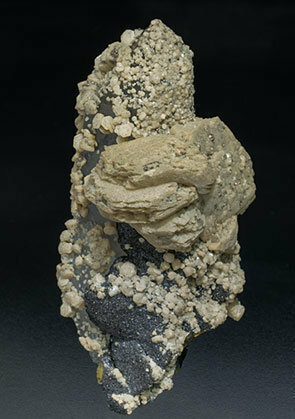 Botryoidal growths of Stannite crystals whose faces and edges have very pronounced curvatures, of deep grey color, with very well defined crystals of Arsenopyrite and Quartz. The piece has a slight fissure but the matrix is stable. The Stannite, which in this locality is easily confused with Sphalerite, has been properly analyzed and we’ll send a copy of the analysis to the buyer. Stannite and Chalcopyrite intergrowths. 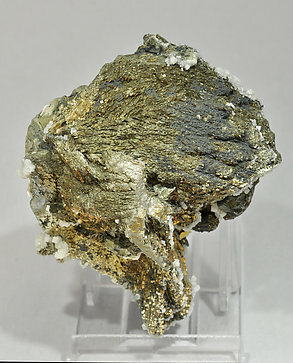 The Stannite is slightly golden dark gray and the Chalcopyrite shows a brass color. 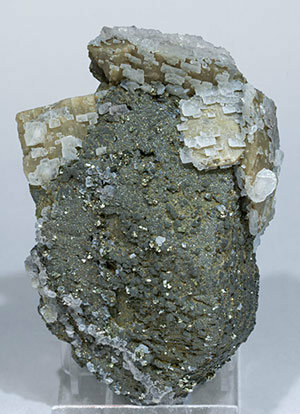 The complexity of these growths, the poor definition of crystalline forms and the fact that Stannite also frequently substitutes for Sphalerite, resulted in Stannite having been almost unnoticed at Panasqueira. We’ll send a copy of the analysis to the buyer. 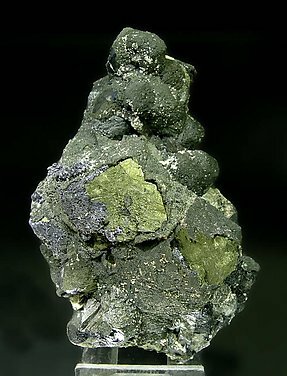 Epigenic growth of very small Stannite crystals on a single Chalcopyrite crystal, with Siderite crystals, Calcite coatings and small Marcasite and Pyrite crystals partially coating the Stannite. We’ll send a copy of the analysis of the Stannite to the buyer of this sample. A curious and unusual form. The crystals of Sphalerite have such curved edges and faces that they appear to be almost spherical. The Stannite is a fine coating, which makes the Sphalerite appear satin. At the base there are some prismatic, well-developed crystals of Arsenopyrite that make this one seem aerial and esthetic. 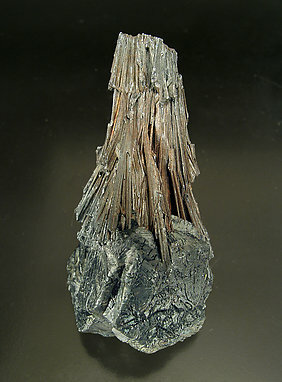 Twinned, giant (for the species) and sharp crystals of Stannite. It came from the finds of old miners in the famous San José Mine. The sample is exceptional both for the quality of Stannite and its esthetics and for the presence of acicular crystals of Zinkenite. The specimen's photo has been reviewed and published in the magazine ‘Rocks & Minerals’ on page 460 in the volume 81, number 6, and in the magazine ‘extraLAPIS - English edition’ on page 31, number 12, "Bolivia".